Golf is becoming more and more accessible these days and an increasingly popular corporate event. A golf day gift is great way to promote your business and creates a lasting impression with your customers and potential customers. Because of this, we have created a range of sterling silver golf items, such as golf ball markers and pitch repairs. These can be personalized with the players initials, creating an individual touch. Golf days are becoming increasingly popular events for businesses, as a way to entertain staff and clients. We were approached by Jersey Telecom to come up with a gift idea for the golf participants, but it was important the gift was something that you couldn’t get off the shelf. 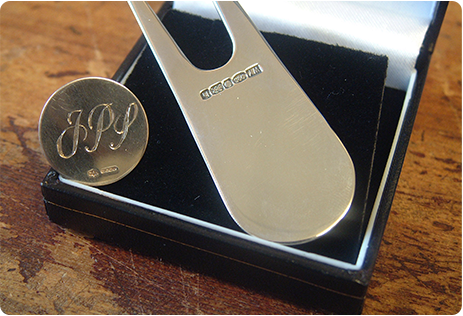 We suggested a hallmarked sterling silver golf ball marker engraved with the recipient's initials. This proved to be a real success and the golf day is still talked about today.